University of Maryland visitors from the Division of Research, from left to right: Ted Knight, Brian Darmody, Gayatri Varma, and Patrick O'Shea. Vice President and Chief Research Officer Patrick O’Shea took a visit to the Eastern Shore of Maryland and Virginia to explore economic development and opportunities to partner and connect the University of Maryland’s research enterprise with Eastern Shore businesses and organizations. The first stop on the tour was the NASA Wallops Flight Facility, located on Wallops Island, Virginia. 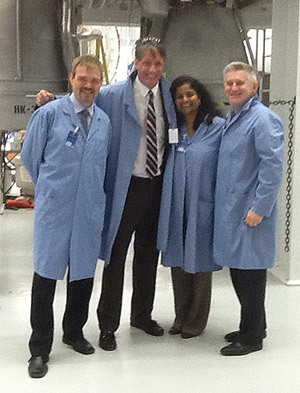 O’Shea, who was accompanied by Associate Vice President and Director of Corporate Relations Brian Darmody, Executive Director of the Office of Technology Commercialization Gayatri Varma, and Director of Research Communications and Government and Corporate Outreach Ted Knight. The group also received tours at Eastern Shore businesses, including Hardwire LLC and Bel-Art, as well as the Small Business Development Center and Economic Development office at Salisbury University. “The University of Maryland is committed to expanding our outreach and partnerships to the Eastern Shore, and we believe there is much we can do together to build closer relationships through collaborative research, tech commercialization and transfer, student internships and recruitment, exchange of expertise, and other activities,” said O’Shea.